New signing Ben Barker has done well. Joint boss Carl Johnson remains convinced Panthers can become Premier league champions. The city side snapped a three-match losing streak when triumphing 52-41 at Rye House on Monday night in their final away fixture. Panthers will be hot favourites to complete their league programme on a high when entertaining struggling Scunthorpe at the Showground on Sunday (3pm). A victory would see them leapfrog likely play-off quarter-final opponents Sheffield into fourth place. Panthers could finish level with third-placed Glasgow if the big-spending Scots slip up in their final meeting – also on Sunday against Rye House – but it would require a couple of freak scorelines for that to happen. But, regardless of which teams stand in their way, Johnson reckons Panthers possess the necessary attitude, application and ability to thrive in the end-of-season battle for honours. Johnson said: “There is no doubt in my mind this team is good enough to win the league. “We have some terrific riders and a hell of a lot of strength in depth. 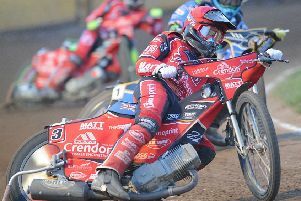 “The recent signings of Ben Barker and Anders Thomsen have made a huge difference as they are both great guys on and off the track. “I know we had a disappointing run of defeats recently, but the way we responded at Rye House on Monday was superb. “It was right up there with our best performances of the season and I certainly class it as one of our most important results. “The fantastic team spirit was clear to see and that has been a constant despite all the problems and changes we’ve been through. “It is a huge achievement even to be in the top six considering the amount of adversity we have had to deal with this season. Panthers bosses have tweaked the riding order ahead of the Scunthorpe clash with Simon Lambert and Michael Palm Toft swapping places in the main body. That means a move to number four for Lambert with MPT taking over at two. Johnson admits the condition of Lambert is a concern with the play-off fast approaching. The Lincolnshire lad recently had four-and-a-half weeks out with a broken shoulder blade and has found the going tough since returning. Johnson added: “It is important we get Simon going well again because his fitness and form are not quite right at the moment.